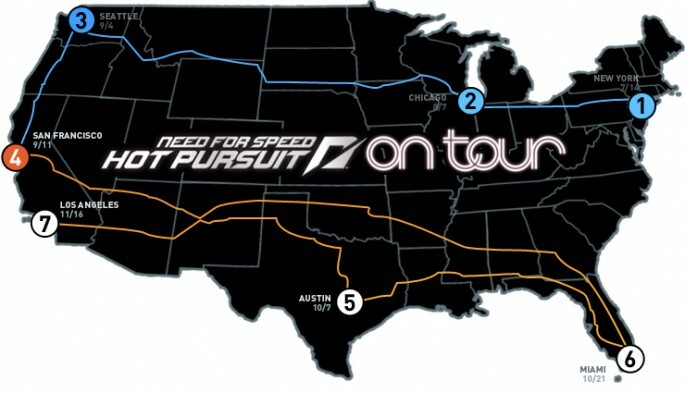 Need for Speed: Hot Pursuit is on tour and we recently attended one of the events being held in San Francisco. Check out our live coverage of the event, our thoughts about the game, and even some Q & A with the game’s marketing team. The last time we met up with the Need for Speed team, it was for some pre-launch publicity and hands on with Need for Speed Shift. With the release of Hot Pursuit coming at us at high speed (November 16th to be exact) EA partnered up with Sony and put on an awesome event in San Francisco, with the press being allowed in 2 hours early complete with open bar (until 9) and a live DJ. The Seacrest County PD was also on hand, to make sure things didn’t get out of hand. They didn’t arrive in the Crown Vics that you would usually see normal police departments drive, but how could you ever refuse their budget requests? Outrunning this is not an option. Before the party took off, EA had members of their product marketing team available to walk the press through the game itself, with a dozen HD TV’s with PS3’s and pre-release copies of the game ready to go. We sat down with a PS3 controller and Andrew Meakin, a Product Marketing rep from EA,who was not only a rep but a pretty serious gamer as well. He walked us through the different aspects of the game (while demonstrating some serious driving skills) and answered all of the questions we had, even if all he could say was “no comment”. Q. What made EA go back to the roots of the Need for Speed franchise? A. EA wants to make sure the NFS series touches on more than just one genre of racing. While Shift was based on track racing and kept to the “Simulation Racing” genre (Shift 2 will continue this when it releases next year), Hot Pursuit wants to stay true to the series with a social game that leans more to the “Arcade Racing” genre. Q. Hot Pursuit introduces a new feature called Autolog. Exactly what is that? A. Autolog is a living, breathing, dynamic social experience that is the very heartbeat of the game itself. It is how every aspect of the game is accessed and controlled. You can see what all of your friends are doing and that is updated in real time automatically. You can compete against them head to head, or just try to beat their times. Every time one of your friends sets a new record, you will be notified and you can jump right in and try to top them. 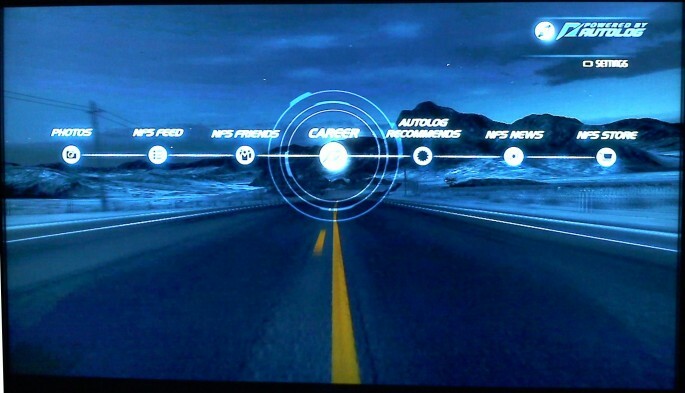 Autolog takes the social aspect of the game and makes it easier then ever to connect to your friends that are currently playing the game, and allows you to top the ones that aren’t. Q. How much emphasis is being put on the cop’s side of the game? A. The same emphasis is put on both aspects of the game. The Cop’s cars are equal to the Racer’s cars, and the only advantage the Cops will have is the helicopter they can unlock once they rank up. Q. Do the Cops and the Racers use the same ranking system? A. You can play as either a Cop or a Racer (or take turns as both), and each type has their own ranking system that will earn you cash and unlock better cars. Ranking up as a Cop will unlock cars that only the Cop can use, and the Racer can unlock cars only they can use. There are two separate online experiences that can be had with the game, and it’s up to you to choose which one you want to drive into at any time. Q. How big will the overall world be? A. It will be four times bigger than Burnout Paradise, and that includes all of the DLC that came out with Burnout paradise. Q. Will the game be open world like Burnout? A. Only in interceptor mode. Q. What is interceptor mode? A. If you are playing as a racer, you will be dropped into a spot on the map. It is your job to not get busted by any Cops that are driving around. If you are playing as a Cop, it is your job to bust that racer. The Cop will have a certain radius around them that if the Racer is within that circle, the Cop will be able to locate him on the map. If the Cop has unlocked the helicopter, then the helicopter has its own radius that aids the cop as well. This mode is completely open world and both the Cop and the Racer can go anywhere within Seacrest County. Q. Can we expect to see some of the old school cars from earlier in the series? A. You’ll just have to stay tuned and see. Q. What is Criterion’s stance on motion gaming and will that be incorporated into any of their racing titles? A. Motion gaming has its advantages for some genres of gaming, but it won’t be incorporated into the NFS series at this time, but we never know what the future may bring down the road. Big thanks to all of the EA reps that were on hand to answer all of our questions, and for providing us with early access to the event. Two hours of uninterrupted gaming allowed us to put the game through its paces, and really get a feel for where they are taking this genre. Need for Speed went back to its roots, and it sure was nice to see the flashing lights chasing us again. With cops like this, is getting busted a bad thing? Check out page 2 for some gameplay video and a gallery of images from the event, including Paul Pierce of the Boston Celtics.